The Qur'an is full of reflections on the Heavens. In the preceding chapter on the Creation, we saw how the plurality of the Heavens and Earths was referred to, as well as what the Qur'an calls an intermediary creation 'between the Heavens and the Earth', modern science has verified the latter. The verses referring to the Creation already contain a broad idea of what is to be found in the heavens, i.e. of everything outside the earth. Apart from the verses that specifically describe the Creation, there are roughly another forty verses in the Qur'an which provide information on astronomy complementing what has already been given. Some of them are not much more than reflections on the glory of the Creator, the Organizer of all the stellar and planetary systems. These we know to be arranged according to balancing positions whose stability Newton explained in his law of the mutual attraction of bodies. The first verses to be quoted here hardly furnish much material for scientific analysis: the aim is simply to draw attention to God's Omnipotence. They must be mentioned however to give a realistic idea of the way the Qur'anic text described the organization of the Universe fourteen centuries ago. The practical angle from which this perfect celestial order is seen is underlined on account of its value as an aid to man's travel on earth and by sea, and to his calculation of time. This comment becomes clear when one bears in mind the fact that the Qur'an was originally a preaching addressed to men who only understood the simple language of their everyday lives. This explains the presence of the following reflections. This calls for some comment. Whereas the Bible calls the Sun and Moon 'lights', and merely adds to one the adjective 'greater' and to the other 'lesser', the Qur'an ascribes differences other than that of dimension to each respectively. Agreed, this is nothing more than a verbal distinction, but how was one to communicate to men at this time without confusing them, while at the same time expressing the notion that the Sun and Moon were not absolutely identical 'lights'? The difference between Sun and Moon will be made clearer by further quotes from the Qur'an. A man of Muhammad's time could easily distinguish between the Sun, a blazing heavenly body well known to the inhabitants of the desert, and the Moon, the body of the cool of the night. The comparisons found in the Qur'an on this subject are therefore quite normal. What is interesting to note here is the sober quality of the comparisons, and the absence in the text of the Qur'an of any elements of comparison that might have prevailed at the time and which in our day would appear as phantasmagorial. There is nothing in the text of the Qur'an that contradicts what we know today about these two celestial bodies. The evening star is qualified in the Qur'an by the word takib meaning 'that which pierces through something' (here the night shadows) . The same word is moreover used to designate shooting stars (sura 37, verse 10): the latter are the result of combustion. It is difficult to say whether these are referred to in the Qur'an with the same exact meaning that is given to the heavenly bodies in the present day. The Qur'an would seem to designate these by the word kaukab (plural kawakib) without stating their number. Joseph's dream (sum 12) refers to eleven of them, but the description is, by definition, an imaginary one. A good definition of the meaning of the word kaukab in the Qur'an Seems to have been given in a very famous verse. The eminently spiritual nature of its deeper meaning stands forth, and is moreover the subject of much debate among experts in exegesis. It is nevertheless of great interest to offer an account of the comparison it contains on the subject of the word that would seem to designate a 'planet'. Here the subject is the projection of light onto a body that reflects it (glass) and gives it the glitter of a pearl, like a planet that is lit by the sun. This is the only explanatory detail referring to this word to be found in the Qur'an. Is it possible that the expression in the Qur'an 'lowest heaven' means the 'solar system'? It is known that among the celestial elements nearest to us, there are no other permanent elements apart from the planets: the Sun is the only star in the system that bears its name. It is difficult to see what other heavenly bodies could be meant if not the planets. The translation given would therefore seem to be correct and the Qur'an to refer to the existence of the planets as defined in modern times. The Qur'an mentions the lowest heaven several times along with the heavenly bodies of which it is composed. The first among these would seem to be the planets, as we have just seen. When however the Qur'an associates material notions intelligible to us, enlightened as we are today by modern science, with statements of a purely spiritual nature, their meaning becomes obscure. The information the Qur'an provides on this subject mainly deals with the solar system. References are however made to phenomena that go beyond the solar system itself: they have been discovered in recent times. A negative fact also emerges from a reading of these verses: it is shown that the Sun moves in an orbit, but no indication is given as to what this orbit might be in relation to the Earth. At the time of the Qur'anic Revelation, it was thought that the Sun moved while the Earth stood still. This was the system of geocentrism that had held sway since the time of ptolemy, Second century B.C., and was to continue to do so until Copernicus in the Sixteenth century A.D. Although people supported this concept at the time of Muhammad, it does not appear anywhere in the Qur'an, either here or elsewhere. The Arabic word falak has here been translated by the word 'orbit'. many French translators of the Qur'an attach to it the meaning of a 'sphere'. This is indeed its initial sense. Hamidullah translates it by the word 'orbit'. The word caused concern to older translators of the Qur'an who were unable to imagine the circular course of the Moon and the Sun and therefore retained images of their course through space that were either more or less correct, or hopelessly wrong. Sir Hamza Boubekeur in his translation of the Qur'an cites the diversity of interpretations given to it: "A sort of axle, like an iron rod, that a mill turns around; a celestial sphere, orbit, sign of the zodiac, speed, wave . . .", but he adds the following observation made by Tabari, the famous Tenth century commentator: "It is our duty to keep silent when we do not know." (XVII, 15). This shows just how incapable men were of understanding this concept of the Sun's and Moon's orbit. It is obvious that if the word had expressed an astronomical concept common in Muhammad's day, it would not have been so difficult to interpret these verses. A Dew concept therefore existed in the Qur'an that was not to be explained until centuries later. We have seen above how the Qur'an underlined the usefulness of observing the Moon's movements in calculating time (sura 10, verse 5, quoted at the beginning of this chapter.) This system has often been criticized for being archaic, impractical and unscientific in comparison to our system based on the Earth's rotation around the Sun, expressed today in the Julian calendar. a) Nearly fourteen centuries ago, the Qur'an was directed at the inhabitants of the Arabian Peninsula who were used to the lunar calculation of time. It was advisable to address them in the only language they could understand and not to upset the habits they had of locating spatial and temporal reference-marks which were nevertheless quite efficient. It is known how well-versed men living in the desert are in the observation of the sky. they navigated according to the stars and told the time according to the phases of the Moon. Those were the simplest and most reliable means available to them. It is more difficult to conceive of the Sun's orbit because we are so used to seeing our solar system organized around it. To understand the verse from the Qur'an, the position of the Sun in our galaxy must be considered, and we must therefore call on modern scientific ideas. The above is the orbital movement of the Sun that was already referred to by the Qur'an fourteen centuries ago. The demonstration of the existence and details of this is one of the achievements of modern astronomy. It appears therefore that a verbal nuance in the Qur'an refers to the Sun and Moon's own motion. These motions of the two celestial bodies are confirmed by the data of modern science, and it is inconceivable that a man living in the Seventh century A.D.-however knowledgeable he might have been in his day (and this was certainly not true in Muhammad's case) -could have imagined them. This view is sometimes contested by examples from great thinkers of antiquity who indisputably predicted certain data that modern science has verified. They could hardly have relied on scientific deduction however; their method of procedure was more one of philosophical reasoning. Thus the case of the pythagoreans is often advanced. In the Sixth century B.C., they defended the theory of the rotation of the Earth on its own axis and the movement of the planets around the Sun. This theory was to be confirmed by modern science. By comparing it with the case of the Pythagoreans, it is easy to put forward the hypothesis of Muhammad as being a brilliant thinker, who was supposed to have imagined all on his own what modern science was to discover centuries later. In so doing however, people quite simply forget to mention the other aspect of what these geniuses of philosophical reasoning produced, i.e. the colossal blunders that litter their work. It must be remembered for example, that the Pythagoreans also defended the theory whereby the Sun was fixed in space; they made it the centre of the world and only conceived of a celestial order that was centered on it. It is quite common in the works of the great philosophers of antiquity to find a mixture of valid and invalid ideas about the Universe. The brilliance of these human works comes from the advanced ideas they contain, but they should not make us overlook the mistaken concepts which have also been left to us. 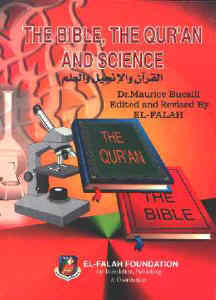 From a strictly scientific point of view, this is what distinguished them from the Qur'an. In the latter, many subjects are referred to that have a bearing on modern knowledge without one of them containing a statement that contradicts what has been established by present-day science. What actually happens however in space? American astronauts have seen and photographed what happens from their spaceships, especially at a great distance from Earth, e.g. from the Moon. They saw how the Sun permanently lights up (except in the case of an eclipse) the half of the Earth's surface that is facing it, while the other half of the globe is in darkness. The Earth turns on its own axis and the lighting remains the same, so that an area in the form of a half-sphere makes one revolution around the Earth in twenty-four hours while the other half-sphere, that has remained in darkness, makes the same revolution in the same time. This perpetual rotation of night and day is quite clearly described in the Qur'an. It is easy for the human understanding to grasp this notion nowadays because we have the idea of the Sun's (relative) immobility and the Earth's rotation. This process of perpetual coiling, including the interpenetration of one sector by another is expressed in the Qur'an just as if the concept of the Earth's roundness had already been conceived at the time-which was obviously not the case. Further to the above reflections on the sequence of day and night, one must also mention, with a quotation of some verses from the Qur'an, the idea that there is more than one Orient and one Occident. This is of purely descriptive interest because these phenomena rely on the most commonplace observations. The idea is mentioned here with the aim of reproducing as faithfully as possible all that the Qur'an has to say on this subject. Anyone who carefully watches the sunrise and sunset knows that the Sun rises at different point of the Orient and sets at different points of the Occident, according to season. Bearings taken on each of the horizons define the extreme limits that mark the two Orients and Occidents, and between these there are points marked off throughout the year. The phenomenon described here is rather commonplace, but what mainly deserves attention in this chapter are the other. topics dealt with, where the description of astronomical phenomena referred to in the Qur'an is in keeping with modern data. How can anybody who is aware of these ideas fail to make a comparison with certain statements found in the Qur'an in which the manifestations of divine Omnipotence are referred to. The Qur'an reminds us several times that: "(God) subjected the sun and the moon: each one runs its course to an appointed term." The Qur'an gives an end to the Sun for its evolution and a destination place. It also provides the Moon with a settled place. To understand the possible meanings of these statements, we must remember what modern knowledge has to say about the evolution of the stars in general and the Sun in particular, and (by extension) the celestial bodies that automatically followed its movement through space, among them the Moon. All these astronomical data deserve to be mentioned in relation to the two verses from the Qur'an, since it is possible to state that they appear to agree perfectly with modern scientific data. Some translators who were unable to grasp the meaning of the latter provide translations that appear to me to be mistaken, e.g. "we give generously" (R. Blachère). Others sense the meaning, but are afraid to commit themselves: Hamidullah in his translation of the Qur'an talks of the widening of the heavens and space, but he includes a question mark. Finally, there are those who arm themselves with authorized scientific opinion in their commentaries and give the meaning stated here. This is true in the case of the Muntakab, a book of commentaries edited by the Supreme Council for Islamic Affairs, Cairo. It refers to the expansion of the Universe in totally unambiguous terms. a) The word 'if' expresses in English a condition that is dependant upon a possibility and either an achievable or an unachievable hypothesis. Arabic is a language which is able to introduce a nuance into the condition which is much more explicit. There is one word to express the possibility (ida), another for the achievable hypothesis (in) and a third for the unachievable hypothesis expressed by the word (lau). The verse in question has it as an achievable hypothesis expressed by the word (in). The Qur'an therefore suggests the material possibility of a concrete realization. This subtle linguistic distinction formally rules out the purely mystic interpretation that some people have (quite wrongly) put on this verse. When talking of the conquest of space therefore, we have two passages in the text of the Qur'an: one of them refers to what will one day become a reality thanks to the powers of intelligence and ingenuity God will give to man, and the other describes an event that the unbelievers in Makka will never witness, hence its character of a condition never to be realized. The event will however be seen by others, as intimated in the first verse quoted above. It describes the human reactions to the unexpected spectacle that travellers in space will see. their confused sight, as in drunkenness, the feeling of being bewitched . . .
«The Creation of the Heavens and the Earth.